Columbus 2020 Senior Vice President of Economic Development, Patricia Huddle, spoke to 65 Chamber of Commerce members at their March meeting. Morrow County is one of 11 counties in the Columbus region. 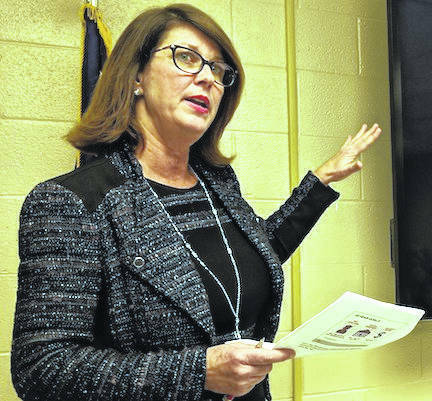 MOUNT GILEAD — Morrow Chamber of Commerce members heard an update of the Columbus region’s growth and success from Columbus 2020 Senior Vice President, Patricia Huddle at their March 19 meeting. Huddle spoke of how Morrow County has directly benefited from the connection it has to Columbus 2020 through its collaboration with Lubrication Specialties Inc., Cardington Yutaka and most recently by giving Morrow County the lead for the Dollar Tree Distribution Center. Morrow County Economic Development Director Andy Ware is working with Huddle as Shane Farnsworth and Pat Davies have in the past. Huddle has made statistics available to Ware for Morrow County with some caparisons to other counties in the region. While Ohio overall had a loss of workforce over the past 10 years, the Columbus region, of which Morrow County is one of 11 counties, experienced explosive growth of workforce over the past 10 years. The Columbus region is also ranked fourth in the nation of cities with large employers of over 1,000 workers. They are right after Orlando, Las Vegas and Jacksonville, Florida. “Prepared communities grow,” Huddle said as she described the emphasis the Columbus region has on collaboration and preparation, rather than competition. Huddle listed the 10-year goals of Columbus 2020 as it was established in 2010. The first goal was to add 150,000 jobs in the region by 2020. Other goals were to increase personal per capita income by 30 percent, to generate $8 billion of capital investment and to be recognized as a national leader in economic development. Columbus 2020 worked successfully with 50-60 nationally recognized companies in 2018. Some of the companies listed were Honda, ACE Hardware, Kohl’s and locally CYT and Dollar Tree. One primary disruptive force to the economy Huddle spoke about was advances in automation. Automation could threaten a couple hundred thousand jobs in several of the region’s businesses and industries. The most susceptible occupations to automation and technology are automotive and transportation, E-commerce, logistics, finance and insurance. Huddle emphasized in closing that “Prepared communities win.” Counties and communities need to know existing conditions in their area and also work on a vision for the future. After they assess the gap between their vision and existing conditions, they need to build consensus and set goals for the future. • Have policies in place for land use and zoning, have incentives for business. • Columbus 2020 Senior Vice President of Economic Development, Patricia Huddle spoke to 65 Chamber of Commerce members at their March meeting. Morrow County is one of 11 counties in the Columbus region. Inventory buildings and sites. • Columbus 2020 Senior Vice President of Economic Development, Patricia Huddle spoke to 65 Chamber of Commerce members at their March meeting. Morrow County is one of 11 counties in the Columbus region.Infrastructure in place. • Knowledge of data and statistics. • Key partners and stakeholders.